If you have never heard of the annotated bibliography, it means that you are either a high schooler or a freshman who hasn’t received real academic assignments yet because this task is like combat debut that sinks into the memory at least for the whole period of studies at college … Just kidding ☺ It’s not that difficult if you figure out how it works. Provide your professor with an overview of the information you base writing on. It should be listed alphabetically. You should format it like bibliographies that comply with footnotes and endnotes. If only a few sources need annotations, they can be very short and added in brackets after the reference. If the bibliographies require more exhaustive annotations though, the descriptions should start from the new line. The format of a reference looks like this: Author’s last name, Author’s first name. ”Article title.” Book/journal title. Publication city: Publishing house, Year. If there are sources by the same author, you can replace the first and last name with a 3-ed dash. In order to show you how it should look like in your actual writing, we’ve also prepared several samples on New York Times nonfiction bestsellers. Enjoy! This book allows us to have a look at the life of a woman who was the first female candidate for a President in the US history. It shows the difficulties connected with gender differences as well as obstacles created by the preceding events (uncovered emails, progressive vote, WikiLeaking, etc.). There is a lot of criticism stating that Clinton blames everyone but herself for her defeat. But at least it gives us a chance to consider her true reasoning behind her decisions. Tur, Katy. Unbelievable: My Front-Row Seat to the Craziest Campaign in American History. Dey Street Books, 2017. The story of sexism seems endless, and Unbelievable proves that it even doesn’t plan to end, especially with the main American sexist on the position of the US President. Katy Tur vividly describes the life of a female reporter covering one of the most powerful men in the world mostly from a negative side, following him through his whole election campaign and being there when Trump won. This is a blunt book that shows the President’s attitude to female professionals and depicts how it can influence the role of a woman in a “free” country and society in general. There is another tip for you here. 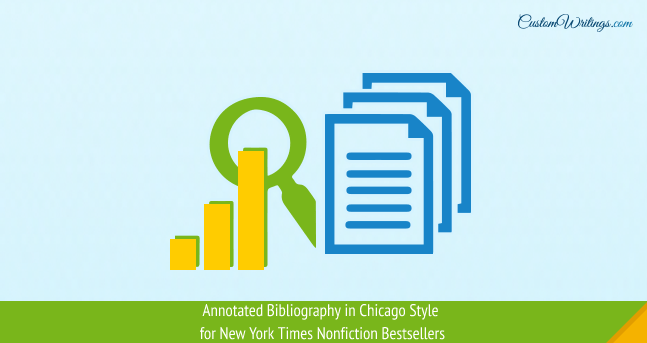 Use the description of the NY Times bestsellers as examples for your annotated bibliographies. Analyze their structure, write down interesting words and descriptions and use them in your own work. NY Times is famous for its reading recommendations, why not to make use of them and get better grades for your papers?